I was not sure, but suspected I would enjoy having a cement mixer to complete little odds’n’ends concrete jobs around the homestead. Concrete work is notoriously physically demanding … that’s otherwise known as Hard Work. But I imagined doing little bits at a time at an old man pace. How hard could two or three batches in a high-quality small-batch mixer be? I know, I know, questions like that often bite you in the sitter-downer. However, the pleasure is all mine. I AM able to get little jobs done without abusing overly abusing my antiquated body. The satisfaction of accomplishment and gratification in having the completed product smoke any passing aches that may have come from a little physical employment. 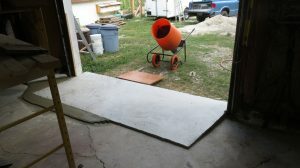 I turned the majority of a 10-yard truckload of sand’n’gravel into a much improved shop apron with concrete pads that enhance the current functionality and set up for THE BIG POUR where hired hands will help me expand the shop to relieve the crowding of woodshop, metalshop and autoshop in a barn that is big enough for any ONE of those activities, maybe two, but definitely not all three. 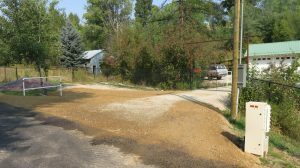 The driveway was much improved before last winter, but I wanted to enter this winter with an easier-to-maintain and significantly safer driveway. It didn’t take a lot of money or time, but the end result is dang-near downtown. Missy’s motorhome and my two-axle car/material hauler trailer bottomed out with the old driveway. Some free fill from the Bunkhouse Road rebuild by the county topped with some good stuff transformed it into a smooth, wide, boulevard. My contractor is an artist, but this old guy running rakes, shovels and wheel-rolling with his Suburban is pretty special too. The two-man team made a driveway I am quite pleased with, and will last in good shape for a long, long time. Still on my list to accomplish before winter is a much improved chicken coop from the remodeled tool shed we inherited, and are currently using. Nevertheless, the girls seem to be happy with their facility. 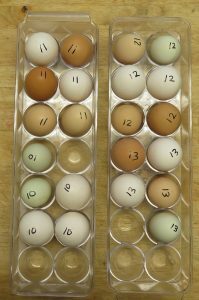 We are definitely happy with the egg production. It matches Missy’s egg consumption almost exactly. I allowed one broody hen to hatch a batch. Thus we have six fledglings coming up. I hope they are mostly hens, but am not getting my heart set on anything yet. The Easter Egg look is simply fun for me. I doubt there is any difference in flavor or nutrition; certainly none that I can attest to. But you cannot buy pretty dozens like we collect here. I put the date on them to facilitate rotation. We never end up with eggs more than a few days old. That’s a far cry from the quite un-fresh stuff you buy in the store. THAT difference we can see and taste. The old woodburner was HUGE, inefficient and seemed dangerous in several ways. Rather than go into another winter running the risk of burning my shop down, I made replacement a priority. 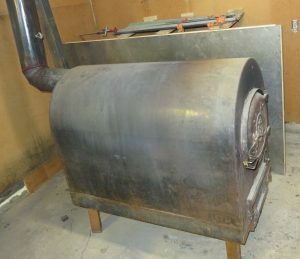 We got that done with a very good used stove and proper new stove pipe. 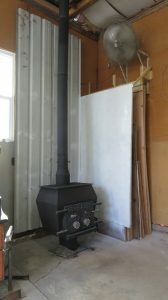 I added heat shielding, combining a storage space for 4′ x 8′ and smaller sheets in the space next to the woodstove. Behind the stove I installed two sheets of scrounged metal roofing material spaced out from the wall with little blocks of 2×4. The cold air enters the one-foot gap by the floor and runs between the metal shield and wood wall to keep the heat roiling up and out rather than cooking my wall to dangerous levels. There is more one my “before winter sets in” agenda, not a lot of time between now and that reality, but I am on a roll. I’ll be as busy as I can physically handle, and optimistic I will get those remaining projects done before hard frost and snow removal season.